Fungi Perfecti’s MycoGrow products are designed for everyone from the home gardener/landscaper to the professional forestry manager, promoting faster growth, speeding transplant recovery and reducing the need for fertilizers and other additives. The term mycorrhizal comes from the Greek words mykes, meaning fungus, and rhiza, meaning root. Mycorrhizal fungi are fungi that have developed a symbiotic (mutually beneficial) relationship with the root systems of living plants, from garden vegetables all the way up to the trees of the Old Growth forests. Networks of mycorrhizal filaments envelop the seedling’s root structure, supporting the plant’s own ability to utilize water and nutrients in the soil. This relationship encourages healthy, vigorous growth. Sadly, modern techniques for clearing and developing land for human use tend to destroy mycorrhizal fungi, thereby reducing the ability of plants to thrive in man-made environments and forcing us to resort to fertilizers and other artificial means of promoting plant growth. It is now possible to re-introduce mycorrhizal fungi to the soil, replenishing and re-vitalizing it in an effective, safe and 100% natural way. Fungi Perfecti’s MycoGrow products are designed for everyone from the home gardener/landscaper to the professional forestry manager, promoting faster growth, speeding transplant recovery and reducing the need for fertilizers and other additives. A number of different formulations are available, for all methods of plant cultivation. Our MycoGrow products contain mushroom species that are approved for use throughout the continental United States and Canada. However, our customers in Hawaii should be aware that they are not permitted in the state of Hawaii. We encourage all international customers to check their countries’ import regulations prior to ordering. See a comprehensive list of plant species that benefit from endo- and ectomycorrhizae here. Check out this amazing testimonial from one of our customers! Read the story of Devon, a student who used our MycoGrow™ products in his sixth-grade Science Fair project, "Fungus or Fertilizer?" If you would like to know more about mycorrhizal fungi, we highly recommend reading Dr. Mike Amaranthus' excellent article, "Mycorrhizal Management: a Look Beneath the Surface at Plant Management and Growth". What’s so great about mycorrhizae? Mycorrhizae support plant health by breaking down hard-to-reach nutrients in the soil and assisting with water retention. Mycorrhizal fungi excrete unique enzymes and antibiotics that support plant health and allow for increased disease resistance. Because the mycorrhizae support plant health, they are most effective as preventative treatments with regard to disease organisms. At what stage is it best to inoculate plants or starts? The earlier the better. Early root and plant growth can benefit greatly from the mycorrhizae. For the earliest application, try our MycoGrow Endo/Ecto Seed Mix, which is applied directly to the seeds prior to planting. For established plants and starts, the MycoGrow Soluble and the MycoGrow for Vegetables are both mixed with water and used to drench the plant roots for inoculation. MycoGrow for Vegetables is also a great mix for applying directly to the soil and mixing dry. If you’ve got very large plants/trees, especially in pots, consider the Plant Success™ Tabs for easy inoculation. What time of year is best for inoculation? It is best to inoculate plants in the spring and the fall – because mycorrhizal spores are activated by root enzymes, it’s ideal to inoculate when the roots are most active. How does temperature affect mycorrhizal spores’ viability? Unless they are exposed to sustained temperatures above 130–140 °F (54.4–60 °C), mycorrhizal spores will remain active and viable for inoculation, even in warm climates. 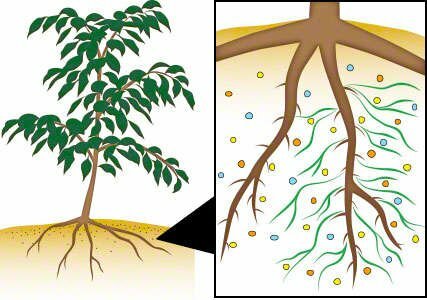 Mycorrhizae will branch out over time, assisting neighboring plants with nutrient and water absorption/retention. That being said, this is a slow process. If you want to ensure colonization, it’s best to inoculate each plant to get it going. Single species or blend – which is better? Blends are better. Different mycorrhizal species specialize at different things – some excel in antibiotic production, others are stronger with regard to nutrient availability. Having diverse species colonization leads to a broader, more comprehensive mycorrhizal support network. What is the shelf-life of the spores in MycoGrow? What bout native/non-native fungi for my area? There is nearly no genomic difference between the various populations of endomycorrhizae found around the globe. Mycorrhizae are very prolific, and species can be found in healthy soils around the world. Some states/countries like Hawaii, New Zealand and Australia have import restrictions. Please check with your customs/agriculture departments prior to ordering. How does the soil itself affect mycorrhizal growth? For the most part, mycorrhizae can grow anywhere that plant roots can grow. They are extremely helpful to plant hosts in poor soil areas. What kinds of things will negatively challenge mycorrhizal growth? Will fertilizer be needed after inoculation with mycorrhizae? On average, treated plants will use/need 20-30% less fertilizer and water. Increased uptake by plants leads to more efficient use of resources. For this reason, many users find that they are able to reduce or even eliminate some supplementation in their inoculated crops. If fertilizer is used, it’s best to avoid fertilizers with very high levels of phosphorus (above 70ppm), as they will encourage lethargy in mycorrhizal growth.